Figure 1. 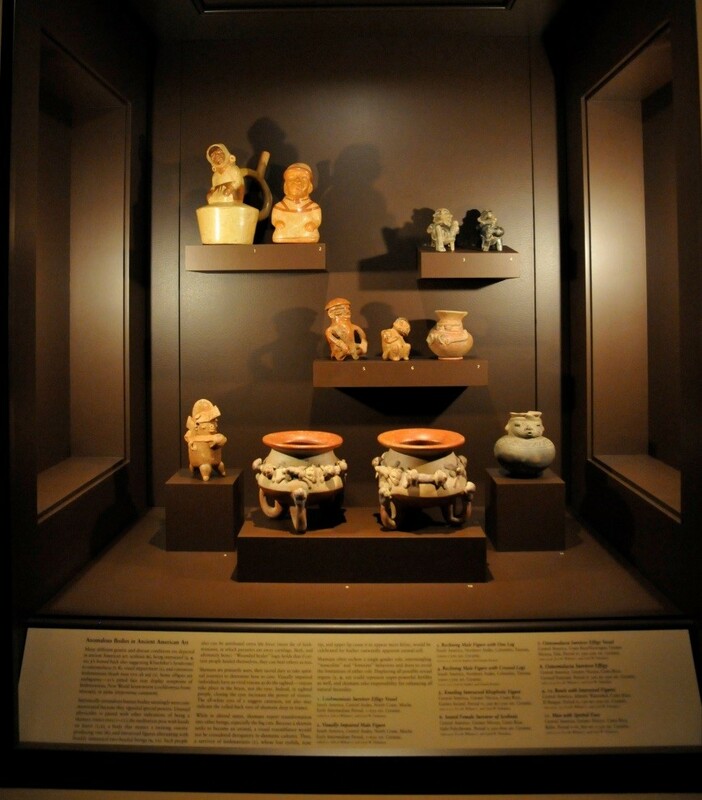 An exhibition case on the first floor of the Michael C. Carlos Museum features a number of ancient American effigies of persons with what we refer to as “disabilities”, including the one at the top left of a man overcoming the flesh-destroying disease we call leishmaniasis. Photograph by Stacey Gannon-Wright, 2017. 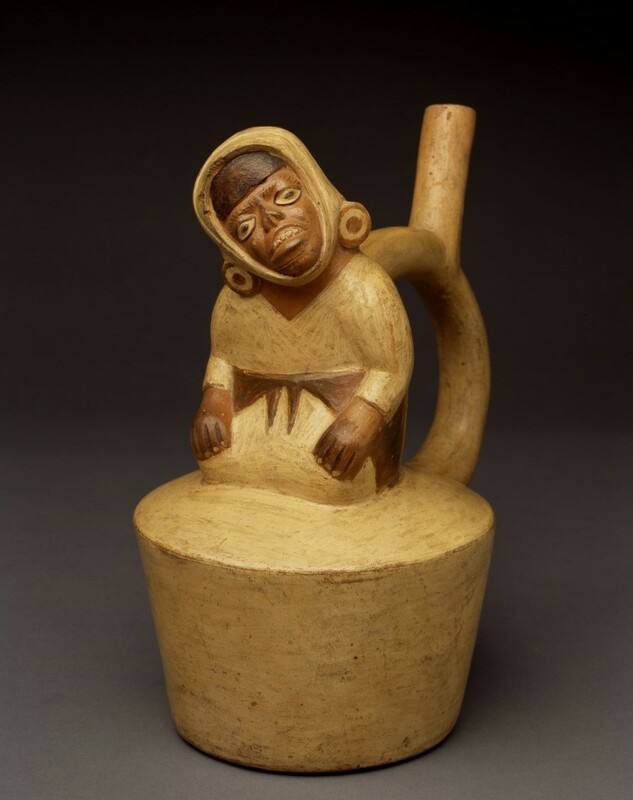 In the Michael C. Carlos Museum at Emory University, as part of the permanent collection of Art of the Americas, there is a case filled with small ceramic effigies from ancient Central and South America. Perhaps not as colorful, imposing, or accessible in meaning as the pieces in the surrounding cases, upon further study these diminutive sculptures nevertheless carry a powerful message—and possibly an unexpected one. To use the current—admittedly presentist—terminology, these effigies depict “disabled” individuals. Upon closer examination, however, it becomes clear that that word does not really apply, because the artistic treatment of these people’s unusual physiognomies speaks eloquently to their subjects’ social and spiritual elevation. They wear prestigious clothing, headgear, jewelry, and body art; they may sit in the meditation pose with their hands on their knees, or grasp their bellies as a sign of fertility. These are clear signs that the subjects have taken on the role of a high-status person, and specifically a shaman, or spiritual intercessor/healer, in their respective cultures and times. Each piece and each condition depicted may differ, yet they all participate in communicating larger concepts and values that are deeply Native American. Through them, the idea is conveyed that healers are ascribed powers because they survived physical challenges; they are not shown as victims, but rather as victors. “Different” seems here to be presented as superior, particularly in a spiritual sense. This perspective serves as an antidote to most historical circumstances that see different as worse. Furthermore, these effigies uniquely embody how shamans routinely walk the line between life and death, male and female, the visible and the visionary. They occupy the productive, yet challenging, “Between”. These sculptures skillfully convey the paradoxes and anomalous being-states involved in the powerfully dualistic role of shaman. In these cultures, being part-animal or seeing internally rather than externally does relate to being given spiritual powers due to surviving a body-altering disease. In shamanism, “disease” is seen as the result of a spiritual attack or punishment for misconduct (such as not conducting a ritual correctly, failing to honor Nature, etc.). Many traditional Amerindian peoples today see harm causing injury or disease as invisible arrows or darts sent by hostile people, shamans, or spirits.5-8 These darts must be found and extracted by a good shaman, who may well take in the harm and expel it with his/her superior powers. Thus, shamanic healing often features the ceremonial blowing of smoke into and through the area of the fontanel to cleanse the consciousness, or sucking an intrusive “object” from the affected part of the body and spitting or vomiting it out.2(pp10,65,79) The disease is reified (concretized) as a thing that can be dealt with, though it was introduced magically, spiritually, invisibly. In contrast, the shaman has the goal to acquire the help, powers, strength, wisdom, and even the look of the actually dominant animals such as the jaguar and the crocodile. Indigenous peoples of the tropics understand deeply that they are not the dominant species on earth. However, many in the Western world even disregard the obvious fact that humans are primates, and thus animals ourselves. We may walk and be able to touch our pinkies to our thumbs; nevertheless, we are animals. Native American thought embraces the concept that: the bear is our brother, the deer is our sister, and so on.9 Thus, it is not necessarily an accusation to be like another animal; in Amerindian shamanism it is a high compliment. Figure 2. A composite of a human-jaguar is a typical way that shamanic art shows the animal self within the human shaman. Ex. coll William C. and Carol W. Thibadeau, Michael C. Carlos Museum, 1991.4.337. Photograph by Bruce M. White, 2013. Artists in the ancient Americas acknowledge the visionary transformational experience in myriad ways, combining humans and other animals in creative and telling compositions (Fig. 2). The Carlos collection is rife with these blended beings that figure so prominently in ancient American art. 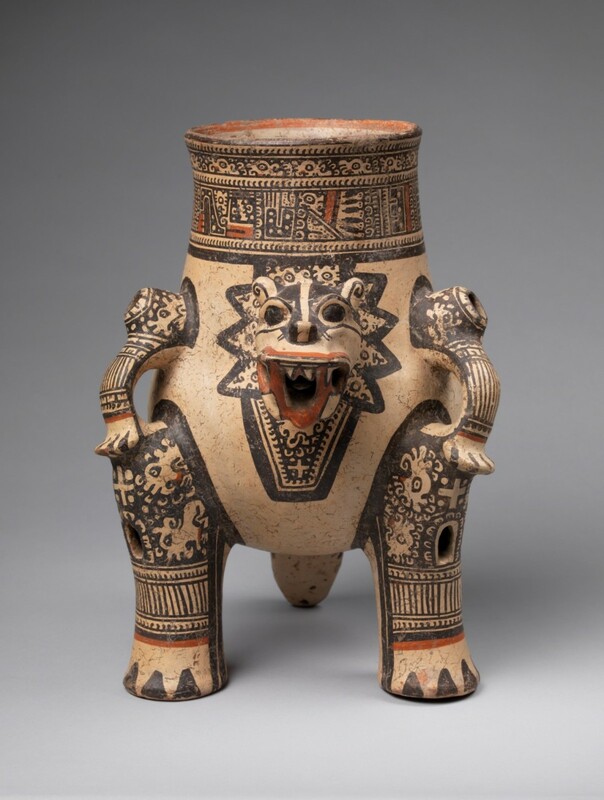 I looked through Emory University’s holdings and easily placed more than a hundred of its pieces in a temporary exhibition, “For I am the Black Jaguar: Shamanic Visionary Experience in Ancient American Art” in Fall 2012. As the curator of a large collection in place since 1988, I did not direct the collecting of objects for this exhibition, except in the area of textiles. Therefore, I did not specifically locate pieces relevant to shamanism; they were preexisting in the collection and “ripe for the picking” as long as I knew how to identify them. The Black Jaguar exhibition celebrated such pieces as Figure 2, which gives a jaguar the vertical stance of a human, placing hands on knees, while emphasizing the bloody fangs of an attacking cat. The spots are segregated onto only certain parts, not as in the real feline but as in a person decorating the body with images of spots to invoke the powers that go with those markings. Each spot is in fact a tiny jaguar, so that the levels of meaning multiply. Yet the important point here is that a person and a cat are masterfully presented as one dualistic being. This piece sets the stage for the first of the featured works. Figure 3. A seated man in the shamanic meditation pose betrays characteristics of someone who has contracted the flesh-wasting disease we call leishmaniasis. Michael C. Carlos Museum, Gift of William C. and Carol W. Thibadeau, 1989.8.72. Photograph by Michael McKelvey, 2008. In Figure 3, a person is illustrated who is experiencing the dreaded flesh-eating disease now called leishmaniasis [leash-meh -NI-ah-sis]. Infected sand flies transfer the disease from dogs and cats to humans. In the muco-cutaneous form of leishmaniasis, cysts form around the nose and mouth, spread, and the flesh begins to die, to the point of exposing the skull in extreme cases.10 Lips, nose cartilage, and eyelids are the first to go. The seated man’s face lacks an upper lip, the end of his nose, and much of the eyelids (which the artist darkened with a black line to draw added attention to this feature). This person is first identified as a man because he wears large round earrings that were male finery; however, his long dress is a female garment, so he may well be between gender categories as is common among shamans in the Americas and worldwide.2(54) He sits with his hands planted on his knees in meditation, a sure sign of the spiritual role.2(74) The notably large earrings also support the shamanic role and high status of this survivor. In the ancient Andes, boys wore small earrings, gradually stretching the ear holes to achieve in maturity the ability to wear giant posts and fronts; the Spanish invaders called the important indigenous men orejones, or “big ears”.11 This individual is depicted as important, high in status, spiritually focused, and having experienced leishmaniasis. Figure 4. Physiognomic portraits of non-diseased individuals are also typical in Moche art. Ex. coll William S. Arnett, Michael C. Carlos Museum, 1999.3.115. Photograph by Bruce M. White, 2012. 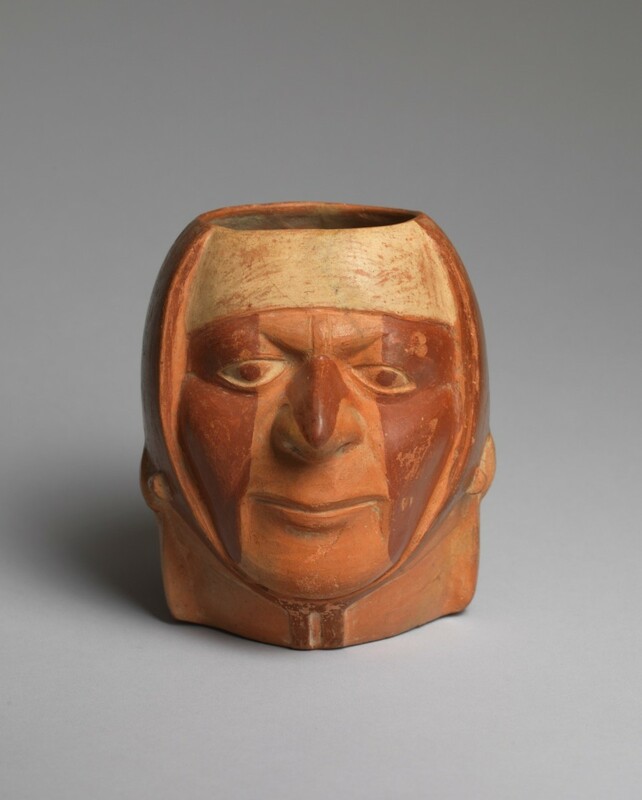 To demonstrate that the face of the individual in Figure 3 is not simply a common face of men—or women—depicted in this era (the Moche of 1-650 AD in Peru), a representative head jar is shown in Figure 4 with soft lips, a prominent nose, and eyes with notable eyelids. In its attention to human physiognomy, the Moche style is unusual in the scheme of ancient Andean, and American, art as a whole. Therefore, Fig. 3’s showing a dramatically blunted nose and fully-exposed upper teeth can be interpreted as a conscious gesture on the part of the artist, and not a typical stylistic choice of the era. Like the several hundred “true” Moche portrait head vessels, Figure 4, with his drooping eyes, wide lips, and particular face-paint pattern, can be interpreted as corresponding to a real individual who looked like that to some degree (although art is always an interpretation, needless to say). Moche portraits depict not only heads but also full-body renditions, many of them depicting the same individuals celebrated in the head sculptures.12 A subset of Moche heads also represents men with the same telltale characteristics of leishmaniasis. In other full-body renditions, visual impairment, loss of limbs, and other conditions are represented.2 Portrait prestige is shared by subjects who are “typical” in their looks and those who are not. This alone speaks volumes about the elevation of what we might call “disability”. In all these images, it is possible to argue that survivorship, rather than pathology, is a strong message. The individual in Figure 3 is shown having his/her face ravaged, as in the mucocutaneous strain of leishmaniasis,10 but not to the point of death. People can live for long periods with cutaneous leishmaniasis; however, if they also have visceral leishmaniasis, they are much less likely to survive. Indeed, previous to modern drug treatment, most people would have eventually died of this illness as it horrifically advanced. Figure 5. The visage of a snarling jaguar features visible teeth, a flat nose, and darkly outlined eyes, which could be seen as generally similar to that of the man in Figure 2, according to shamanic belief in animal selves. Photograph courtesy of Pixabay. Returning to the issue of humans and animals, the face of someone in the throes of this disease can be likened to that of an animal, specifically a feline (Figure 5). A jaguar’s prominent teeth, bulging eyes, and relatively flat nose with nostrils protruding from the plane of the head are points of similarity between the jaguar and Figure 3. The artist darkening the outlines of the enlarged eyelid-less eyes also mimics the coloration of jaguars, which have strongly black-outlined eyes. Once again, this visual echoing communicates ultimate prestige, being likened to the king (and queen) of the jungle, the Americas’ most powerful apex predator, the highest of the high. Jaguars’ abilities are legendary: they swim, climb trees, kill anacondas and caiman, see in the dark, hunt day or night, leap 21 feet in a single bound.14 In the tropics, they rule. Therefore, in shamanic logic, to resemble one is to manifest not dis-ability or dis-ease but ideal, true power. Such power was evidenced in the jaguar-person’s apparent ability to live with and perhaps overcome such a dreaded condition as leishmaniasis. What a person with advancing leishmaniasis and the jaguar may share is a profound spiritual connection, not simply a physical one with the similar fangs, nose, eyes. 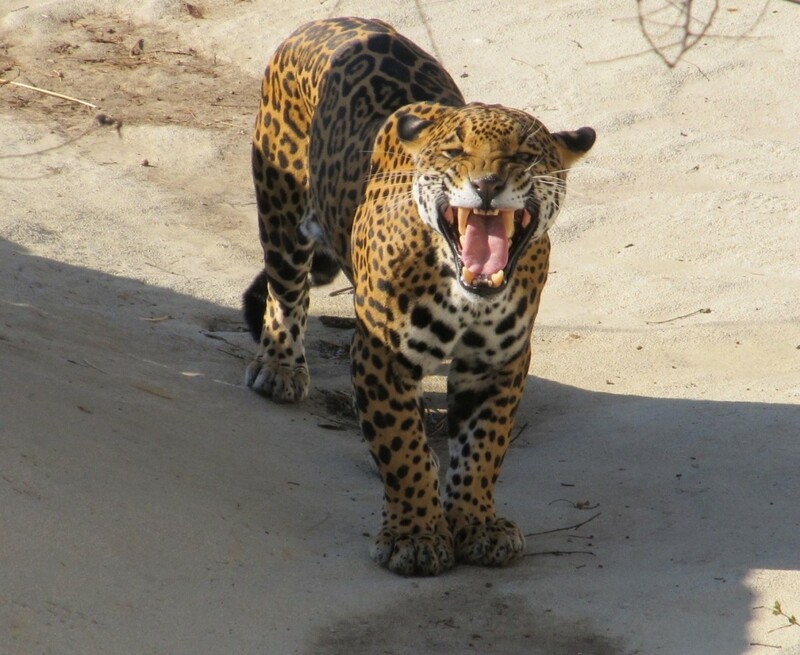 If the outer manifests the inner, a staple of Andean worldview and shamanic experience, then a person with such features is manifesting a jaguar-self. They can use those prodigious powers to intercede with the spirit realm on behalf of others with the condition, according to the logic of the wounded healer. A jaguar is a consummate hunter and killer, a spirit that serves shamans well in hunting out and destroying the malevolent invisible disease “darts”. Although the latter person did not become specifically a jaguar during trance, he did hunt in his vision precisely as a tiger does by breaking necks (whereas jaguars crush skulls). Note that he used the direct phrasing, “what a tiger feels,” not the indirect “as if I were a tiger that feels…”. The Taulipang shaman likewise avows “I am the black jaguar” without distancing himself in any way from his animal self. Indeed, most Central and South American ancient languages and those that continue in use to this day use the same word for shaman and for jaguar, which translates as jaguar.2(p63) There are myriad other quotes about the experiencing of becoming wild animals spread throughout my previous work and that of many ethnographers and other scholars, showing this is a common occurrence during trance. Western medicine thankfully has found a way to stem the tide of leishmaniasis, although it still affects not only Americans but Asians and others living in the tropics.10 Although no disease can be seen as “good”, it remains important to note that other cultures, today and in other times, may elevate those who appear to conquer them, even if temporarily, and elevate them to having special healing powers. The Native American positive attitude toward anomalous bodies—seeing them as decidedly not disabled—seems fairly unusual in world history and culture. Therefore, recognizing the wide range of human responses to the interrelated issues of what constitutes disease, curing, health, and survival is all the more crucial in today’s world. Such cross- temporal and cultural awareness may inform present-day global attitudes in intriguing ways. Empowerment is a theme that can unite rather than divide. Stone R. Nothing is missing: spiritual elevation of a visually impaired Moche shaman. In: Millett-Gallant A, Howie E, eds. Disability and Art History. New York: Routledge; 2016. Stone R. The Jaguar Within: Shamanic Trance in Ancient Central and South American Art. Austin, TX: University of Texas Press; 2011. Stone-Miller R. Seeing with New Eyes: Highlights of the Michael C. Carlos Museum Collection of Art of the Ancient Americas. Atlanta, GA: Michael C. Carlos Museum; 2002:227. Parks SV. ‘Dis’-abilities as Divine: Bodily Anomalies and Shamanic Power in Ancient Costa Rican Ceramic Effigies [honors thesis]. Atlanta, GA: Emory University; 2013. Langdon EJM. Dau: shamanic power in Siona religion and medicine. In: Langdon EJM, Baer G, eds. Portals of Power Shamanism in South America. Albuquerque, NM: University of New Mexico Press; 1992:50. Baer G. The one intoxicated by tobacco. In: Langdon EJM, Baer G, eds. Portals of Power Shamanism in South America. Albuquerque, NM: University of New Mexico Press; 1992:84. Perrin M. The body of the Guajiro shaman: symptoms or symbols? In: Langdon EJM, Baer G, eds. Portals of Power Shamanism in South America. Albuquerque, NM: University of New Mexico Press; 1992:107. Luna LE. Icaros: magic melodies among the Mestizo shamans of the peruvian amazon. In: Langdon EJM, Baer G, eds. Portals of Power Shamanism in South America. Albuquerque, NM: University of New Mexico Press; 1992:242. Cameron C. Creature spirits everywhere about as: a voice of Black Elk.” In: Eaton R, ed. The Human/Animal Connection. Incline Village, Nevada: Sierra Nevada College Press; 1985:30-41. World Health Organization. “Leishmaniasis Fact Sheet N°375.” January 2014. Stone-Miller R. Seeing with New Eyes: Highlights of the Michael C. Carlos Museum Collection of Art of the Ancient Americas. Atlanta, GA: Michael C. Carlos Museum; 2002:194. Donnan CB. Moche Portraits from Ancient Peru. Austin, TX: University of Texas Press; 2004:113. Halifax J. Shaman: The Wounded Healer. New York, NY: Thames and Hudson; 1982. Wolfe A, Sleeper B. Wild Cats of the World. New York, NY: Crown; 1995:95. Salomon F, Urioste G. The Huarochirí Manuscript: A Testament of Ancient and Colonial Andean Religion. Austin, TX: University of Texas Press; 1991:16-18. Saunders N. Icons of Power: Feline Symbolism in the Americas. London, England: Routledge; 1998:32. Naranjo C. Psychological aspects of the Yage experience in an experimental setting. In: Harner M, ed. Hallucinogens and Shamanism. New York, NY: Oxford University Press; 1973:185. One Hundred Names for Love is organized into two parts. Part One, The Cartography of Loss, opens at the moment of Paul’s stroke and continues through his inpatient rehabilitation at the hospital. Diane describes these early weeks as frustrating, confusing, and exhausting—both for her and Paul. With little understanding of what the future might hold, she was now faced with making life choices for both of them. The early diagnosis from the speech-language pathologist (SLP) included: oral apraxia and severe apraxia of speech; expressive and receptive aphasia; and dysphagia with risk of aspiration. Diane watched hopefully as Paul struggled to talk—as he gradually formed more words (although it was mostly jargon) and occasionally produced more meaningful sentences, like “I speak good coffee!” Diane struggled to find new ways of communicating with him and found that carrying on one-sided conversations was exhausting. Although Diane’s memoir focuses mostly on Paul’s aphasia, she also describes the complex disruptions caused by the stroke—his visual field cut; his problems with walking and balance; and his inability to recall and follow through on multistep tasks of everyday life such as getting in and out of bed, managing personal hygiene, and eating and swallowing. Throughout these weeks in the hospital, Paul expressed his fervent desire to go home. And Diane finally agreed. At six weeks post-stroke, she moved Paul and his rehab program home. Ackerman devotes more than half the book to Part Two, A House Made of Words. Here she describes their time at home and her realization that she would have to take charge of Paul’s rehab program. Diane refused to accept the bleak prognosis for Paul’s future. She was buoyed by a visit from their acquaintance, well-known neurologist and author Oliver Sacks, who counseled them not to listen to doctors who said there was only a short window of opportunity for improvement, noting: “You can continue to improve at any time, one year, five years from now. … I have a relative who kept making important improvements ten years after her stroke.” (p. 119). From her study of the brain, Diane knew that, to prompt his brain cells to grow more connections and the right connection, Paul needed an enriched environment (every bit as much as the lab rats who thrived in enriched cages). Thus, she set out to drench Paul in meaningful language and meaningful routines. “Wanna hear about the four major types of prostate surgery?” (p. 205). “In the library, there’s a photo of you and Diane standing next to another couple in front of a little plane. It’s a neat photo. Where were you going?” (p. 206). Such inquiries would launch a series of exchanges as they worked together to uncover the details about the object—with Paul remembering key words and Liz successfully guessing or Liz ending the search by saying, “We’ll ask Diane.” (p. 208). Diane described numerous ways she worked to reshape their home and reinvent daily routines that could accommodate Paul’s new ways of navigating physical spaces, decrease his dependence on her for routine activities, and minimize her concerns for his safety. They installed raised toilet seats, bought him an electric razor, and made certain areas of the house (such as the kitchen stove) off-limits. “So much now dumbfounded him, especially household gadgets,” (p. 137), Diane recalled. She also worked to minimize his daily frustrations, adding brightly colored dots to the buttons he routinely used on the remote control for the television and the control panel for the microwave oven. To help prevent him from falling, she hired people to install a railing in the garden to make it easier for Paul to get safely to the swimming pool on his own. Paul met with the men to make sure the railing height was just right. With each of her decisions, Diane pursued her goals of helping Paul participate in life and above all to reconnect with his love of language. By engaging him so intensely in meaningful communication and by supporting all of his spoken and written attempts, Diane pushed Paul to be creative and playful with the words he did produce and to savor them all. When she suggested, at only two months post-stroke, that Paul start working on his own memoir of aphasia, he agreed. Liz’s role then expanded to that of literary assistant, taking dictation at first and later helping edit his written drafts. [iv] His memoir of aphasia, The Shadow Factory,5 was published in 2008. “Used to have…hundreds,” he said with infinite sadness. “Now I can’t think of one.” (p. 249). So, Diane challenged Paul to make up new names for her, and he responded by greeting her every morning for one hundred days with a new imaginative nickname—Celandine Hunter (celandine is a yellow-flowering poppy that has been used as an herbal medicine); Swallow Haven; Spy Elf of the Morning Hallelujahs; and 97 more. [v] It is this playful activity of devising a new repertoire of romantic nicknames that gives the book its title, One Hundred Names for Love. During Paul’s early recovery, five different SLPs visited them to provide in-home therapy sessions. Diane recalls that, despite the hardworking and polite professionalism of each of the SLPs, they didn’t know Paul, and Paul disliked what he perceived to be their “condescending and too corrective manner” (p. 190-191). His face flashed in disbelief. “How is that possible?” He asked quietly, as if thinking out loud. Looking back at the scan’s deadened landscape, and shaking his head again. Diane closes the book with two short chapters. The Epilogue gives readers a glimpse of Paul at five years after his stroke having regained much of his command of, and love for, language. In Postscript: Some Lessons Learned, Diane reflects on how their experiences redesigning their home life to work Paul’s brain hard every day resonated with many current directions in clinical research. Specifically, she highlights immersion programs, supportive and adaptable communication partners, a focus on meaningful and creative communication, and developing functional and supportive routines that recognize the often too-limited energies available to patients and caregivers alike. Memoirs such as One Hundred Names for Love provide opportunities to explore the lived experiences of stroke and aphasia from the perspective of specific patients, their family members, and their everyday activities. Although Ackerman had written a popular book exploring the mysteries of the human brain and discussing developments in modern brain research, the contributions of this memoir are not in its detailed accounts of brain damage or neuroscience, and specialists may actually quibble with some of Ackerman’s use of terms. Readers should not approach memoirs as if they are textbooks, just as clinicians should not approach individual clients as if they are simply textbook examples of stroke and aphasia. What One Hundred Names for Love does offer is an evocative account of one couple’s experiences with aphasia. Drawing on the work of anthropologists,8 my colleagues and I have argued for the value of thick description9—that is, for interpreting disciplinary categories through the personal meanings and lived experiences of the individuals being observed. We have argued that clinical reasoning involves a specialized form of thick description that requires clinicians to understand a client’s clinical profile through a detailed understanding of the activities and practices of each client’s everyday life worlds. However, our analysis of more than 70 years of published articles documented that thick description of the lived experiences of people with acquired cognitive-communication disorders is exceedingly rare in the research literature on aphasia and related disorders. Given this general absence, memoirs such as One Hundred Names for Love can help to fill the gap and critically extend the vision of life after brain damage. In the clinical literature, Paul’s case would be treated as an outlier on the typical recovery curve—displaying an unexpected and extremely positive outcome. The challenge for clinicians and researchers alike is to resist the urge to dismiss Paul’s case as simply an anomaly, and instead to approach it with curiosity. We need to ask ourselves why Paul’s recovery was so successful and how we might work to replicate such success with other clients. Clearly Paul and Diane had advantages—such as financial and medical resources, flexible work schedules, and social networks—and no doubt Paul’s premorbid drive to achieve along with his exceptional linguistic and communicative abilities aided his recovery. However, we should not assume that these differences alone account for his success. We need to consider as well what the value is of tailoring therapy to the unique activities of specific people, of working with clients and their families as rehabilitation partners who can structure enriching environments outside of the clinic, and of developing interventions to target the flexible and creative communicative practices of everyday life, not just the predetermined linguistic productions typical of drills. One Hundred Names for Love is a beautiful and thought-provoking read that should prompt rich and important discussions, whether among students and teachers or among experienced clinicians and researchers. Throughout the book, Diane’s account resonated with the experiences I have heard from many individuals with aphasia and their families across my clinical and research career. 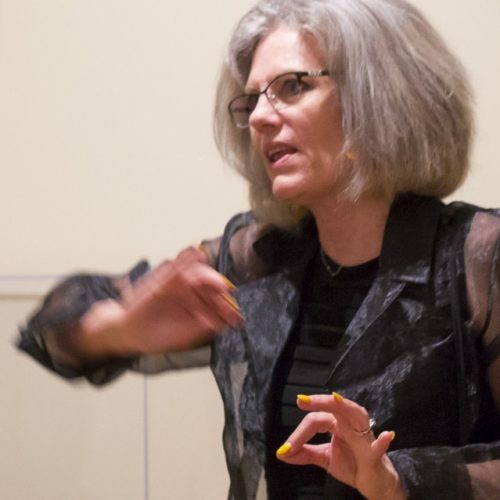 For newer clinicians, Diane’s rich portrayal of the cartography of loss brings home the confusion, fear, and exhaustion that patients and their families face during acute care as they adjust to the realities of stroke, the uncertainties of their diagnoses and prognoses, and the routines of rehabilitation programs. I have found this section to be particularly helpful in highlighting the importance of providing educational resources and communication counseling. Novice clinicians, for example, can be encouraged to discuss Diane’s evolving understandings of Paul’s condition and the educational materials and conversations that helped her along the way. In Part Two, Diane’s descriptions of filling the house with language provide many good examples of meaningful and supportive conversational practices that Diane and Liz employed with Paul, despite his limited spoken language. Both novice and experienced clinicians will find it useful to discuss the differences that Diane describes between the playful, nonjudgmental practices of Paul’s nurse, Liz, and the corrective drills and responses of the SLPs. I have long argued that SLPs should be communication experts10—in practice as well as in knowledge—flexibly altering their communicative roles both to support each client’s successful participation and to meaningfully address diverse communication goals. Thus, for a field that has been dominated by clinician-directed models of intervention, close attention to the power of other practices and stances can be very instructive and inspiring. Finally, discussions of the choices Diane made and Paul’s remarkable recovery should lead to provocative reflection about the goals and implementation of interventions for aphasia. The book highlights the gap between occasional therapy and a comprehensive (all-day, everyday) program. I believe that many of us have felt that too much weight is put on, too many hopes are pinned to, just a few hours of clinical therapy each week. As clinicians, this recognition could lead us to make working with clients and their families to design enriched home environments a central goal of our therapies. 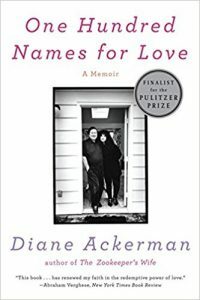 A Hundred Names for Love —a finalist for the 2011 National Book Critics Circle Award and the 2012 Pulitzer Prize—offers a wonderfully nuanced and insightful narrative of aphasia and life. Ackerman’s detailed accounts of how—and how successfully—she created a rich environment to support Paul’s ongoing recovery can also serve as an inspiration for clinicians, clients, and their families to work out creative ecologies for learning through life after brain damage. Ackerman D. One Hundred Names for Love: A Stroke, a Marriage, and the Language of Healing. New York: Norton; 2011. Ackerman D. An Alchemy of Mind: The Marvel and Mystery of the Brain. New York: Scribner; 2004. LeFevre KB. Invention as a Social Act. Carbondale, IL: Southern University Press; 1987. John-Steiner V. Creative Collaboration. Oxford, UK: Oxford University Press; 2000. West P. The Shadow Factory. Santa Fe, NM: Lumen; 2008. Luria AR. The Man with a Shattered World: The History of a Brain Wound. New York: Basic Books; 1972. Sacks O. The Man who Mistook his Wife for a Hat. New York: Harper & Row; 1970. Geertz C. The Interpretation of Cultures: Selected Essays. New York: Basic Books; 1973. Hengst JA, Devanga S, Mosier H. Thin vs. thick description: analyzing representations of people and their life worlds in the literature of Communication Sciences and Disorders (CSD). Am J Speech Lang Pathol. 2015;24:S838-S853. Hengst JA, Duff MC. Clinicians as communication partners: developing a mediated discourse elicitation protocol. Topics Lang Disord. 2007;27(1):37-49. Hengst JA, Duff MC, Dettmer A. Rethinking repetition in therapy: repeated engagement as the social ground of learning. Aphasiology. 2010;24(6-8):887-901.